Liittyy aiheisiin Digital graphic recording, Digital Sketchnoting, Euviz, Euviz2018, IFVP. 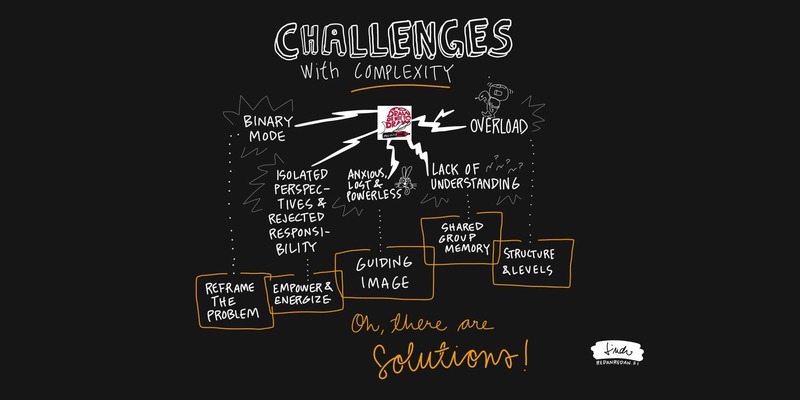 What happened when a digital graphic recorder took her iPad and attended an EuViz/IFVP conference for the first time? Well, I naturally took some notes during the keynotes. I also observed things and noticed something. Here are some of my observations. We people clearly want to put labels on things. Or on visual practitioners. 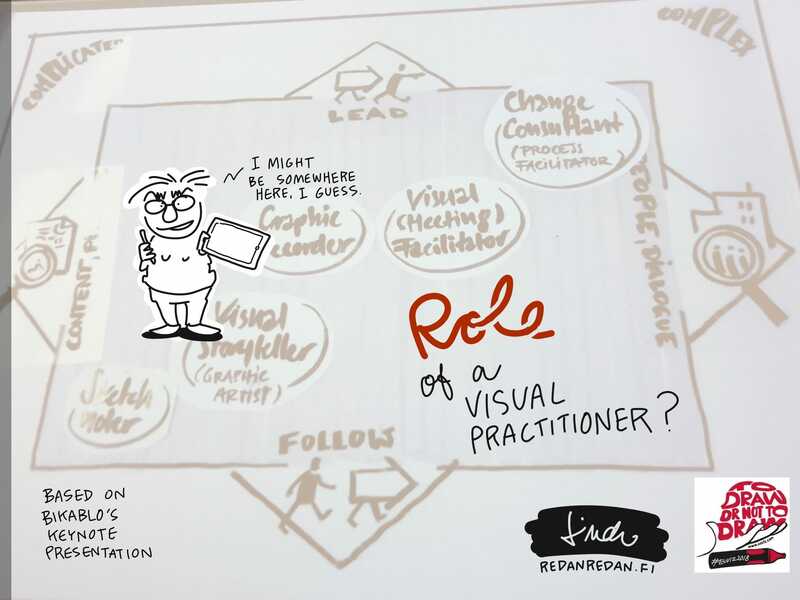 We ask questions like ”Are you a facilitator?” or ”Are you a consultant?” Then we answer something like ”No, I’m a graphic recorder.” or ”I’m a turbo-powered business thinking chaos and renewal catalyst that uses visualizations.” or what ever suits our label or maybe the customer’s label best. 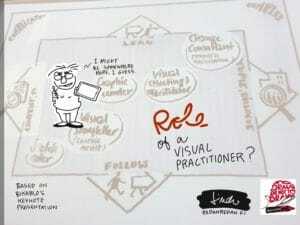 It is true that we visual practitioners come in many shapes. But what we have in common is the power and responsibility that our images give us. Larger than life or just another job? In the conference there were activities that made me step back a little. If we’re told to receive a morning parcel from above or to be in touch with the source, I start to thing either Postman Pat or Jedi knights. The force wasn’t strong in me in those kind of situations. Sorry. 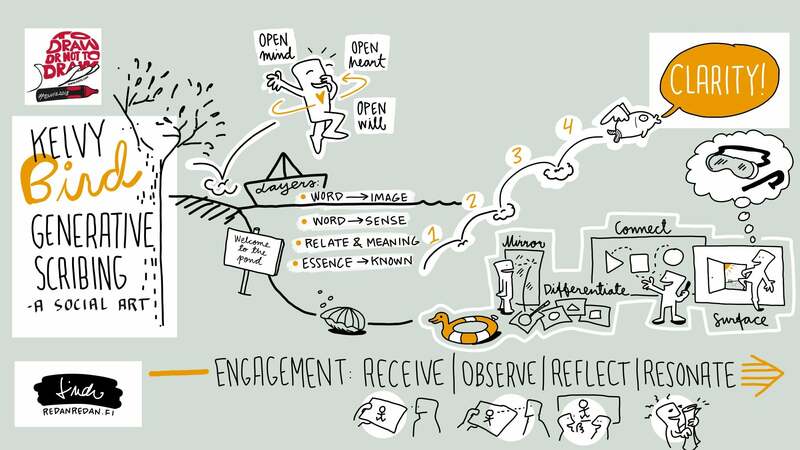 In a fishbowl discussion that we had during the conference there was this one lady that said something about us showing the customers that they too can do what we do; that creating visualizations isn’t a superpower. Still I think we as a group were acting at times a little bit as if it is a superpower, this ability to do what we do. Which way is it? Are we working droids or Jedi knights? Or could there be something in between? 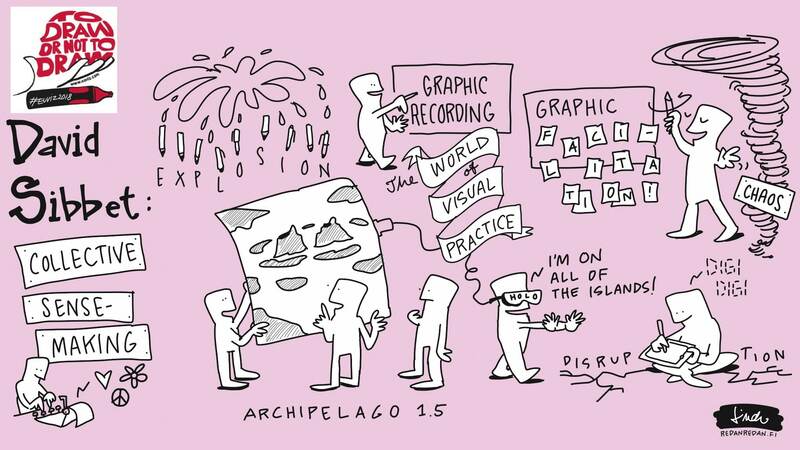 Our field of visual practicing is growing. More and more start working in the field so more and more solo entrepreneurs come in. I wonder if it’s going to be like in the translation business? That there will be a couple of big players and then a row of small companies with 1-2 people working in them? To me, we didn’t exactly seem to be a group of growth-oriented business-minded fortune seekers. In case we are too happy with our work and its little scale, that might leave some room for those who think bigger. Who do we want to have in control of our businesses? I was also happy to see that my style of doing visualizations is my style even on the international level and it works! I like things fast and working with an iPad gives me both the speed and the flexibility that I want. 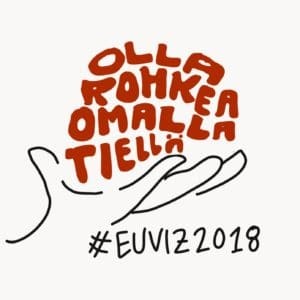 We in Finland seem to be into digital ways of working. Having the background in pedagogy made both Raquel and me think if we could offer something more for the visual community. Let’s see what we can come up with. Stay tuned. 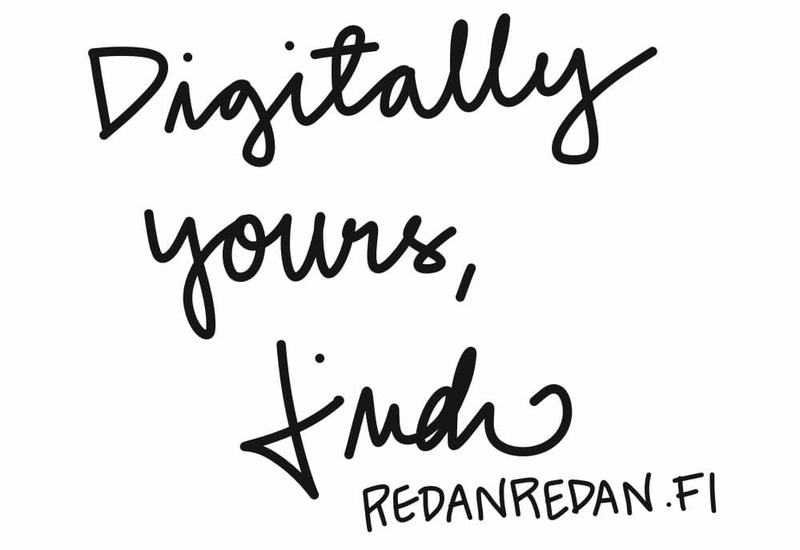 When it comes to sketchnotes and graphic recording, my path has been digital from the beginning, since 2010 when I bought my 1st gen iPad. I’m curious to know what kind of tools the future brings me. 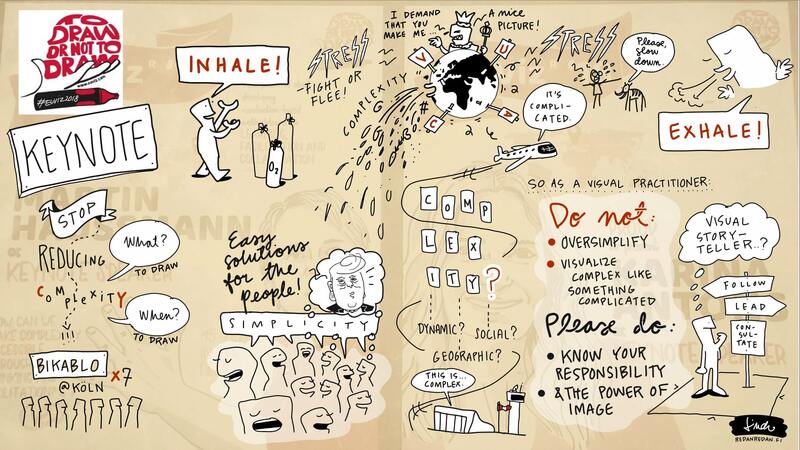 But in the whirlwind of digital tools one thing remains: the power of visual language and how it affects people. 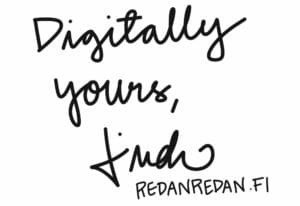 No matter if I work digitally or if the others use pen and papers, we have the ability to map out and at times even create change. What does a sketchnoter do in the summertime? It came with a blast: summer! And that’s why I’ve been glued to my screen watching the green leaves only through the window.